We are a small and eclectic floral studio trying to offer the community an alternative to the traditional “FTD-style” design. Each and every design is a one of a kind creation, so we’re always thankful that folks will allow us the trust to make them something lovely without seeing what that is ahead of time. I compare our sales/design method to that of a 5-star restaurant. The chef gets up early to get to the markets and see what seems to be especially fresh or premium that day. They buy the food and bring it back to the kitchen, where they create a menu item just for that day. They don’t offer a menu with photos of the plated meal, instead the waitstaff offer an oral description of the what, from where, and how of the item. Perhaps after only selling 10 servings, the daily special may be sold out and another item made to replace it. That’s how it works in our back room. I seek out flowers from growers, wholesalers, and importers from all around the globe. Sometimes they surprise me with unique floral stems, other times customs will seize the boxes due to some concerns. Our inventory changes rapidly throughout any given week. We avoid the more commonplace stems in favor of the exotic and romantic. I describe my style as an ‘edgy & elegant mash-up of Flemish and modern sculptural” , and I continue to be very thankful and humbled that the McHenry county community appreciates our efforts. 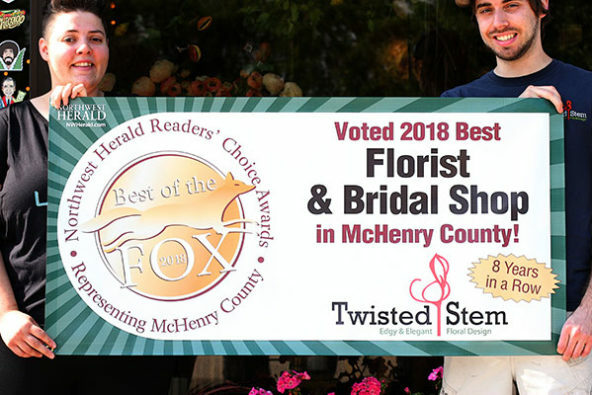 Shaw Media and the Northwest Herald will once again be soliciting your votes in the 2019 Best of the Fox.